You stumbled upon this blog? Enjoyed your visit? A quick note in my guestbook would be highly appreciated. Please, let me know of any broken link or error whatsoever that you may encounter while browsing this site. This blog is not financed by the intrusive advertising below. So you may want to use an ad blocker. What’s the Harm in Taking an Antidepressant? A hundred years ago," Gordon said, "physicists understood that energy — like light or magnetism or electricity — took the form of continuously flowing waves. We still refer to `radio waves' and `light waves.' In fact, the recognition that all forms of energy shared this wavelike nature was one of the great achievements of nineteenth-century physics. "But there was a small problem," he said. 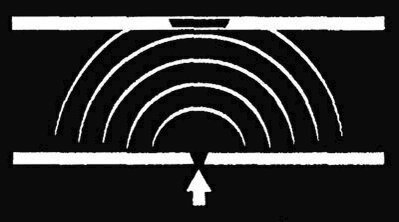 It turned out that if you shined light on a metal plate, you got an electric current. The physicist Max Planck studied the relationship between the amount of light shining on the plate and the amount of electricity produced, and he concluded that energy wasn't a continuous wave. Instead, energy seemed to be composed of individual units, which he called quanta. "The discovery that energy came in quanta was the start of quantum physics," Gordon said. "A few years later, Einstein showed that you could explain the photoelectric effect by assuming that light was composed of particles, which he called photons. These photons of light struck the metal plate and knocked off electrons, producing electricity. Mathematically, the equations worked. They fit the view that light consisted of particles. Okay so far?" "And pretty soon, physicists began to realize that not only light, but all energy was composed of particles. In fact, all matter in the universe took the form of particles. Atoms were composed of heavy particles in the nucleus, light electrons buzzing around on the outside. So, according to the new thinking, everything is particles. Okay?" "The particles are discrete units, or quanta. And the theory that describes how these particles behave is quantum theory. A major discovery of twentieth-century physics." "Physicists continue to study these particles, and begin to realize they're very strange entities. You can't be sure where they are, you can't measure them exactly, and you can't predict what they will do. Sometimes they behave like particles, sometimes like waves. Sometimes two particles will interact with each other even though they're a million miles apart, with no connection between them. And so on. The theory is starting to seem extremely weird. "Now, two things happen to quantum theory. The first is that it gets confirmed, over and over. It's the most proven theory in the history of science. Supermarket scanners, lasers and computer chips all rely on quantum mechanics. So there is absolutely no doubt that quantum theory is the correct mathematical description of the universe. "But the problem is, it's only a mathematical description. It's just a set of equations. And physicists couldn't visualize the world that was implied by those equations - it was too weird, too contradictory. Einstein, for one, didn't like that. He felt it meant the theory was flawed. But the theory kept getting confirmed, and the situation got worse and worse. Eventually, even scientists who won the Nobel Prize for contributions to quantum theory had to admit they didn't understand it. "So, this made a very odd situation. For most of the twentieth century, there's a theory of the universe that everyone uses, and everyone agrees is correct — but nobody can tell you what it is saying about the world." "What does all this have to do with multiple universes?" Marek said. "I'm getting there," Gordon said. Many physicists tried to explain the equations, Gordon said. Each explanation failed for one reason or another. Then in 1957, a physicist named Hugh Everett proposed a daring new explanation. Everett claimed that our universe — the universe we see, the universe of rocks and trees and people and galaxies out in space - was just one of an infinite number of universes, existing side by side. Each of these universes was constantly splitting, so there was a universe where Hitler lost the war, and another where he won; a universe where Kennedy died, and another where he lived. And also a world where you brushed your teeth in the morning, and one where you didn't. And so forth, on and on and on. An infinity of worlds. Everett called this the "many worlds" interpretation of quantum mechanics. His explanation was consistent with the quantum equations, but physicists found it very hard to accept. They didn't like the idea of all these worlds constantly splitting all the time. They found it unbelievable that reality could take this form. "Most physicists still refuse to accept it," Gordon said. "Even though no one has ever shown it is wrong." Everett himself had no patience with his colleagues' objections. He insisted the theory was true, whether you liked it or not. If you disbelieved his theory, you were just being stodgy and old-fashioned, exactly like the scientists who disbelieved the Copernican theory that placed the sun at the center of the solar system — and which had also seemed unbelievable at the time. "Because Everett claimed the many worlds concept was actually true. There really were multiple universes. And they were running right alongside our own. 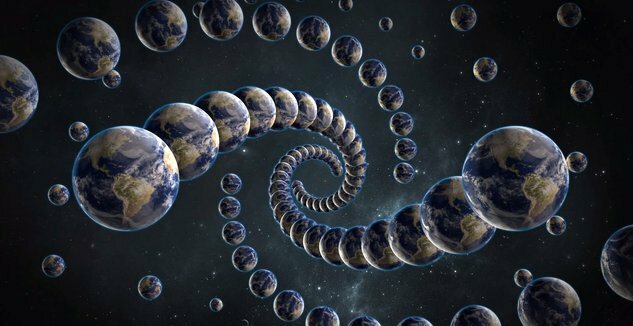 All these multiple universes were eventually referred to as a `multiverse.' "
"Wait a minute," Chris said. "Are you telling us this is true?" "Yes," Gordon said. "It's true." "How do you know?" Marek said. "I'll show you," Gordon said. And he reached for a manila file that said "ITC/CTC Technology." He took out a blank piece of paper, and began drawing. "Very simple experiment, it's been done for two hundred years. Set up two walls, one in front of the other. The first wall has a single vertical slit in it." He showed them the drawing. "Now you shine a light at the slit. On the wall behind, you'll see..."
"A white line," Marek said. "From the light coming through the slit." "Correct. It would look something like this." Gordon pulled out a photo on a card. Gordon continued to sketch. "Now, instead of one slit, you have a wall with two vertical slits in it. Shine a light on it, and on the wall behind, you see..."
"Two vertical lines," Marek said. half as many bars as before. Because every other bar goes black." Marek frowned. "More slits mean fewer bars? Why?" "The usual explanation is what I've drawn - the light passing through the slits acts like two waves that overlap. In some places they add to each other, and in other places they cancel each other out. And that makes a pattern of alternating light and dark on the wall. We say the waves interfere with each other, and that this is an interference pattern." Chris Hughes said, "So? What's wrong with all that?" "What's wrong," Gordon said, "is that I just gave you a nineteenth-century explanation. It was perfectly acceptable when everybody believed that light was a wave. But since Einstein, we know that light consists of particles called photons. How do you explain a bunch of photons making this pattern?" There was silence. They were shaking their heads. David Stern spoke for the first time. "Particles aren't as simple as the way you have described them. Particles have some wavelike properties, depending on the situation. Particles can interfere with one another. 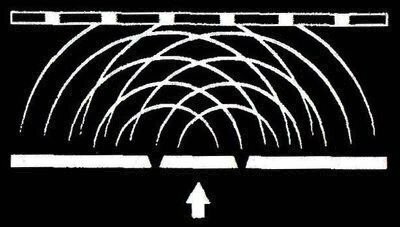 In this case, the photons in the beam of light are interfering with one another to produce the same pattern." "That does seem logical," Gordon said. "After all, a beam of light is zillions and zillions of little photons. It's not hard to imagine that they would interact with one another in some fashion, and produce the interference pattern." They were all nodding. Yes, not hard to imagine. "But is it really true?" Gordon said. "Is that what's going on? One way to find out is to eliminate any interaction among the photons. Let's just deal with one photon at a time. This has been done experimentally. You make a beam of light so weak that only one photon comes out at a time. 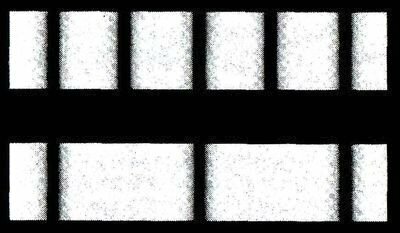 And you can put very sensitive detectors behind the slits — so sensitive, they can register a single photon hitting them. Okay?" They nodded, more slowly this time. "Now, there can't be any interference from other photons, because we are dealing with a single photon only. So: the photons come through, one at a time. The detectors record where the photons land. And after a few hours, we get a result, something like this. "What we see," Gordon said, "is that the individual photons land only in certain places, and never others. They behave exactly the same as they do in a regular beam of light. But they are coming in one at a time. There are no other photons to interfere with them. Yet something is interfering with them, because they are making the usual interference pattern. So: What is interfering with a single photon?" Stern shook his head. "If you calculate the probabilities-"
"Let's not escape into mathematics. Let's stay with reality. After all, this experiment has been performed - with real photons, striking real detectors. And something real interferes with them. The question is, What is it?" "It has to be other photons," Stern said. "Yes," Gordon said, "but where are they? We have detectors, and we don't detect any other photons. So where are the interfering photons?" Stern sighed. "Okay," he said. He threw up his hands. Chris said, "What do you mean, Okay? Okay what?" Gordon nodded to Stern. "Tell them." "What he is saying is that single-photon interference proves that reality is much greater than just what we see in our universe. The interference is happening, but we can't see any cause for it in our universe. Therefore, the interfering photons must be in other universes. And that proves that the other universes exist." "Correct," Gordon said. "And they sometimes interact with our own universe." "I'm sorry," Marek said. "Would you do that again? Why is some other universe interfering with our universe?" "It's the nature of the multiverse," Gordon said. "Remember, within the multiverse, the universes are constantly splitting, which means that many other universes are very similar to ours. And it is the similar ones that interact. Each time we make a beam of light in our universe, beams of light are simultaneously made in many similar universes, and the photons from those other universes interfere with the photons in our universe and produce the pattern that we see." "And you are telling us this is true?" "Absolutely true. The experiment has been done many times." Marek frowned. Kate stared at the table. Chris scratched his head. Finally David Stern said, "Not all the universes are similar to ours?" "Are they all simultaneous to ours?" "Therefore some universes exist at an earlier time?" "Yes. Actually, since they are infinite in number, the universes exist at all earlier times."